Most people are familiar with using Carbon to purify water or to remove the taste of chlorine, for example. 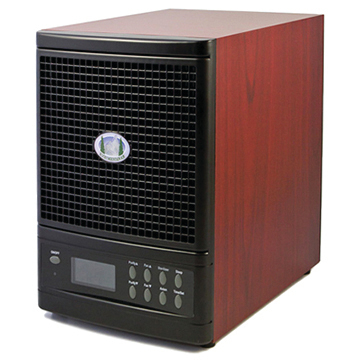 Rocky Mountain Air Purifiers use activated carbon in two forms. The powdered block form of activated Carbon is infused into the foam filter used in the SUMMIT and the CLOUD. The second form, granular, is found in the ADVANCED CARBON FILTER which is exclusively used in the Summit PLUS air purifier. The Summit PLUS' Advanced Carbon Filter is twice the width of our standard carbon filter, and is filled with coarse, granular carbon media, including coconut shell carbon. This results in greater absorption of odors out of the air you breathe in your home or office. Utilizing the micro-pore properties of the coconut shell carbon, in conjunction with the structure of the overall size and larger surface area of this chunky carbon, allows more odors to be captured, drawn deep inside the media, and locked away. The carbon filter's absorption limit is reached at about 12 months in a non-smoking environment. This is why it is so important replace the carbon filter on a yearly basis. We have incorporated Zeolites into our Advanced Carbon Filter which boosts its ability to capture gases such as formaldehyde. The combination of our carbon media and zeolites create a superior ADVANCED CARBON FILTER. Seven Stages Of Purification: Activated Carbon FilterTo address a major issue facing homeowners, foul smelling air, Rocky Mountain Air® has included an Activated Carbon Filter in each of our home air purification systems. Carbon filtration causes Carbon-based impurities (organic chemicals) to bond with the filter allowing the contaminants to be absorbed as air circulates through each air purifier. By trapping impurities such as vapors, odors, and other hydrocarbons, each Activated Carbon filter effectively eliminates unwanted odors from your home or office.